Imagine this: the bassist and drummer are laying a bluesy foundation down, the rhythm guitarist is playing that 12-bar blues, and everyone expects you to somehow play a grand solo over it. You look at your band members with despair! What to do? Many people start playing guitar with visions of hour-long jams where the music just keeps on flowing. Unfortunately for quite a few of these players, they end up thinking that soloing or improvising isn’t for them. They believe that it’s some kind of magic only a few gifted people possess. Over the course of a few articles, I hope to take away this unwanted feeling by giving a step-by-step guide on how to improvise. In this first article we’ll start with the very basics, that is, the 12-bar blues and the pentatonic scale. While, at least for the rest of this article, you don’t really need to be able to play such a progression, it is quite important to have a feel for how it sounds. 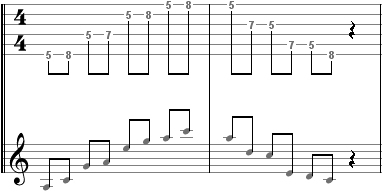 You can read more about the 12-bar blues in David’s article Before You Accuse Me. So in other words, the A minor pentatonic scale consists of the following notes: A, C, D, E, G. The easiest way to learning where all these notes are is by dividing the neck into small areas, called ‘boxes’. To keep it simple, we’ll just introduce the first box this article, and introduce others in future articles. This first box starts at the 5 th fret of the 6 th string, and goes all the way up to the 8 th fret of the 1 st string, as shown below. Before we’ll do anything else, we must make sure we know this box inside out, and the rest of this article contains a bunch of exercises to practice this scale. The first one is the most boring one, but there really is no way around it. Grab yourself a metronome, set it to a slow tempo, and play the following tab repeatedly. Fret each note at the 5 th fret with your index finger, each note at the 6 th fret with your middle finger, each note at the 7 th fret with your ring-finger and each note at the 8 th fret with your pinky. Make sure each note rings clearly. When you are comfortable playing the scale, increase the tempo of the metronome slightly and start again. Once again, start at a slow tempo and gradually increase it. When you can play this tab comfortably, move on to the next one. 5 th fret of the 6 th string. 5 th fret of the 1 st string. C) Say “root – A” to yourself. D) Continue with the tab. Congratulations! You now know all the notes of the pentatonic minor scale in A, and because you learned the numbers that belonged to it, you will later find it just as easy to find notes when playing in other keys. “What, another scale?” you might be thinking now. Don’t worry! The blues scale is pretty much a pentatonic minor scale with just one tiny note added. This is the flatted fifth (designated “bV”) and is called the “blue note.” As you will later find out, this note can really add that bluesy touch to what you are playing. See the table below to see where this blue note can be found in the first box of the A-minor pentatonic scale. Now just play the three exercises again, playing the blue notes before you would otherwise play an E note. Don’t forget to use the same procedure to remember its name, saying “blue note – Eb” to yourself when you play one. The last thing we’ll do in this article might seem very unfair, but it really isn’t just here to frustrate you (no, really…). We’ll end this article by giving three MIDI backing tracks, and the goal is to simply play over it using the A-minor blues scale. You can play any of the tabs given above, or just play something else, it really doesn’t matter. The goal is to get a better feeling of how a blues-bar sounds. Just relax, play and listen to yourself. Try to hear what does and what doesn’t sound very good, and don’t worry if it doesn’t sound superb yet. We’ve barely started the journey into the land of improvisation, so just sit back and enjoy! And for those who are curious, our next article will deal with various techniques like bending and hammer-ons, and will bring some sort of structure to how you can improvise. Plus, we’ll introduce a new box. MAN! thanks for the incredible insight! Great lesson I would like to see more on .Blues Solo Improvisation with the Basic.